Herbie Hancock's masterpiece, now cut at 45 RPM! Double LP 200-gram discs plated and pressed at Quality Record Pressings! Hancock's own solo career blossomed on Blue Note, with classic albums including Maiden Voyage, Empyrean Isles and Speak Like a Child. 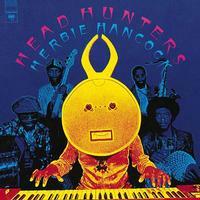 After leaving Davis' fold, Herbie put together a new band called The Headhunters and, in 1973 in San Francisco, recorded Head Hunters.